The Butcher Block owners (from left) Eddy Rogers, Rhonda Entner and Patrick Fechser. The Butcher Block sits adjacent to a gas station right off the freeway in Liberty Lake, but it has a true downtown market feel. String lights crisscross the ceiling, items are artfully scrawled on chalkboards above glass cases brimming with meats and cheeses, and pictures of old Spokane butcher shops hang on the walls. 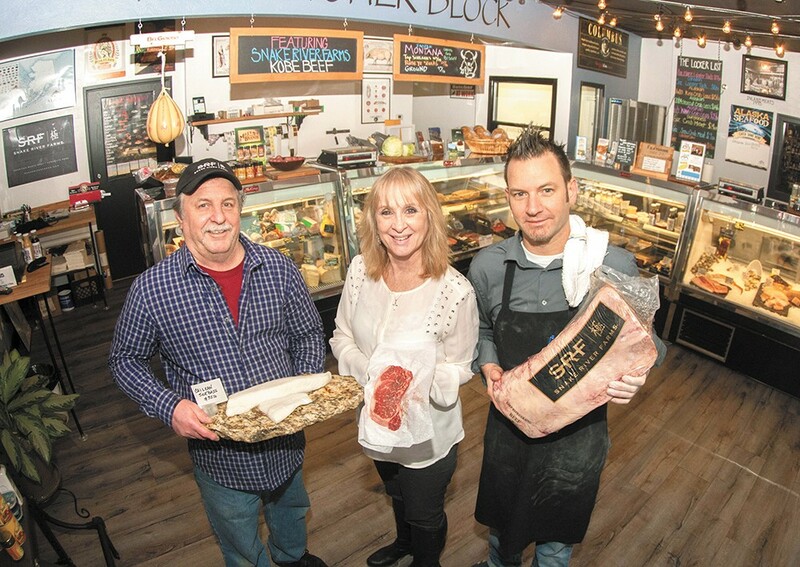 But the Butcher Block isn't a butcher shop, but rather a meat and seafood market opened several weeks ago by the owners of Hay J's Bistro, located just two doors down. As far as the meats go, they try to buy as Northwest as possible, says Patrick Fechser, who owns the market with his mom Rhonda Entner and her cousin Eddy Rogers. The American-style Kobe beef comes from Snake River Farms in Idaho, with selections such as rib eye ($28/lb.) and center-cut top sirloin ($11/lb.). The Washington-raised chicken is free-range, without hormones and air-chilled. And the grass-fed Montana bison comes in top sirloin ($16.50/lb. ), rib eye ($22/lb.) or ground ($9/lb.). Most of the seafood, on the other hand, hails from Alaska. Wild Alaskan halibut ($21/lb.) and king salmon ($19.50/lb.) can be found in the case, along with Hawaiian seafood flown in weekly, such as mahi-mahi ($28/lb.) and yellowfin ahi ($34/lb.). "We focus on quality and freshness," Fechser says. "We don't have any cheap meat." Fechser, Entner and Rogers decided to open the Butcher Block because the landlord wanted the empty space filled. They played with ideas of making it a banquet room or catering kitchen, but chose meat market when they saw a niche. "There's becoming more of a demand for these specialty markets, rather than those big-box stores where you can buy everything — shoes and meat in the same place," Fechser says. The Butcher Block's products go beyond meats to include cheeses (local and imported), Hay J's items such as soups, salad dressings, spices and rubs, and kitchen equipment like knives, pans and cutting boards carved by Rogers.